Warmer days are well on their way, and those nights spent cowering under weighty blankets are coming to a close. For those we lost over the past six months after the temptress Netflix cast its spell, welcome back. Trust us, nothing leaves the cold weather and antisocial months behind like jumping on an elevator and heading up to cocktails, bites, and birds’ eye views. …You know, if birds were eyeing off the piña colada’s. Rise above the heat this Spring with Brisbane’s growing collection of rooftop bars. An eagle and a kangaroo walk into a bar, and the rest is history. From panoramic views to aesthetically pleasing white seating and greenery, Eagle’s Nest is one that you won’t want to leave. Prepare to tackle some tapas and pomegranate daiquiris with your crew for that sky high feel. W-here has this place been all our lives. Be treated to ultra-modern digs, with uber artsy monochromatic walls for the totalllyyy perfect Instagram shot. You can lounge by the pool with plenty of cocktails, eats and summer beats. Not complaining. Making our way downtown, walking fast, faces pass, and we’re bar bound. The king of Queen Street rests on top of NEXT Hotel, providing a tropical oasis for those scorching summer days. Seriously, what’s better than sipping a cheeky cosmo straight up by the pool? 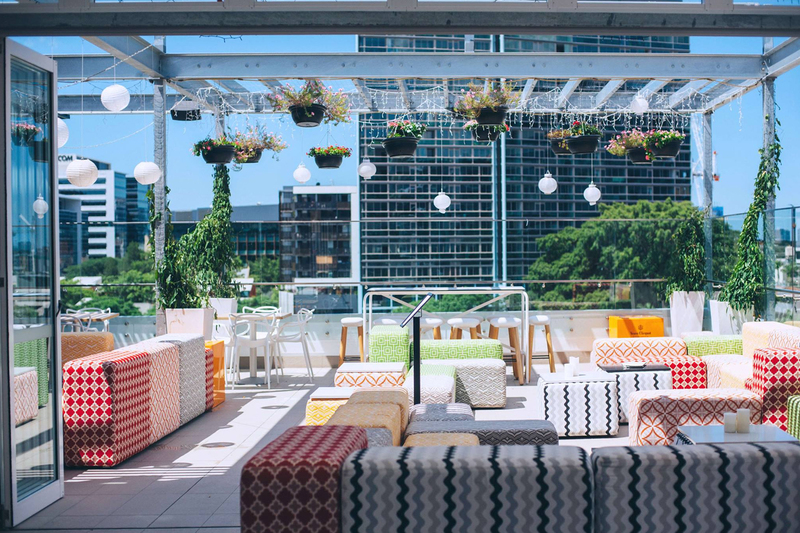 There’s more than one reason this sky high bar is one of our fave spots for a breezy summer drinking sesh, but we’re pretty sure we only need to tell you one: sweet agave espresso martinis. Sip one of those while you take in the view from their colourful lounges and you’ll wish it was summer all year round. Whether you’ve reached the eleventh hour of those cocktail cravings or simply want to impress (OK, show off to) out-of-town visitors, Eleven is one of Brisbane’s crowning glories. Head to the eleventh floor for tapas, fine dining, or the ability to gorge on pulled pork and chorizo arancini while still looking elegant (-ish). The perfect cocktail in one hand and some of Brisbane’s best bites in the other? It’s no tall order for the gang at Elixir. From tastes of tapas to satiate that beer-inspired hunger to the impressive ploughman’s board, we don’t need an elixir to enjoy these views – but we’ll take one anyway. Prepare yourself – after one poolside Sunday session at Soleil, you can say ‘so long’ to any other weekend plans. Take your weekend to the podium level of South Bank’s Rydges Hotel and learn why this pool bar was named for the French word for ‘sun’. OK, we’ll tell you: it’s ‘cause shared cocktails, pizzas, and peking duck spring rolls are the light of our lives. We’re choosing to ignore the fact that our hangovers now take two days to recover from – sweet sixteens come any weekend you like at Sixteen Antlers. Take the elevator to the 16th floor of the city’s Pullman Hotel for brioche sliders and the legendary CCC martini, a concoction of booze, espresso, chilli, and chocolate. Have your cocktail cravings reached their peak? Take your post-work or Sunday sessions to the top of South Brisbane’s The Fox Hotel. With cocktail jugs, DJs, wood-fired pizzas and some of the city’s best views, your whole night will be just Dandy. Hear the word ‘clubbing’ and already feel the claustrophobia working its way in? Swap jam-packed underground spots for the balcony and tiki bar fit-out at Fitz + Potts. While others are sandwiched between clubbing crowds, you’ll be set with a gourmet jaffle platter worthy of your top dance moves. Some raise the roof. Others sit on them and drink martinis. Champagne, charcuterie and rosé? We want some of that. The rooftop party of the year has popped up in Ascot thanks to the legendary Society Spring Series team. With racecourse views, free-flowing brews and DJ tunes, you’ll be racing back for another sesh without hesitation.